This summer I spent a weekend staining the fence in my back yard with the kind help of my mother and father. Manual labor frees the mind to think and I started thinking about the application of the Theory of Constraints and Lean to the task of painting a fence...yes, I was in the sun too long. My fence is a typical 4 ft cedar fence. It has 4x4 posts every 6 to 8 feet. Connecting the posts are a pair of 2x4s. One 6 inches above the ground the other is level with the post. The fencing is made of cedar planks that are drilled into the spanning 2x4s with a couple inch gap between each plank. There are two types of work when painting a fence. One type is the large brush (or painting pad) work to cover the the large wood planks. The second type is the trim work. 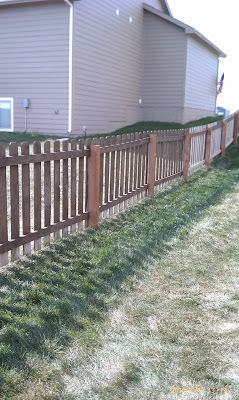 The trim work on the outside of the fence is painless. A couple inches between each plank and the edges of each plank. The inside of the fence is another story. The trim work inside the fence includes the two 2x4s that span between the posts and the sections of the plank above and below those spanners. My father and I both started by worked on the large plank work. It took 30-45 minutes for my father and I to finish painting the large planks of the first side of the fence, however my poor mother was still finishing the trim work from the first 5 foot section. My Theory of Constraints brain kicked in and I started to think about the 5 Focusing Steps. It was obvious the trim work was the constraint in our system (step 1). When ToC talks about “Exploiting the constraint” it means to squeeze all the capacity out of the constraint that you can. Don’t allow the constraint to do anything activity that isn’t the constrained activity. In this case my mom was fully exploited. She wasn’t being distracted by the children or asked to grab drinks. She was just painting trim. My mom was fully exploited...from a ToC standpoint. What we should have done to subordinate everything else to trim work (step 3) is to have the large brush work only paint area where the trim work was done, but I knew it would be difficult to convince my dad. Having everyone do trim work wouldn’t “feel” like we were getting much done. I chose a compromise. I had a quick talk with my father to develop a new plan. He would continue to use the painting pad, but he should do as much of the trim work as possible. I would switch to a 2” brush and help my mother with the trim work. The outside of a fence is much easier to paint since it is mainly large panels. The structure inside the fence contains the top and bottom 2x4s that span between the posts. This side of the fence requires more trim work. The top, bottom and side of each of the 2x4s plus the sections above and below the spanners that aren’t large enough to get with the large paint pad. While working on the outside of fence, my father painted the front of the panel, the top and each of the half inch sides. On the backside of the fence, he was able to get the top and middle sections, but not the bottom section. He also did the spanners, but knew the “trimmers” would finish up the work. Splitting the task into specializations of large brush work and trimming we created a large amount of work in progress (WIP). Nothing was “done”. Each section of fence required somebody to go back and “rework” the unfinished plank and trim. We could visualize how much work was left, but we needed to calculate the duration. We need to know that we had enough daylight to complete the work. Basing our duration estimates on how long it took us to partially complete a fixed length of fence didn’t give me much confidence. The final issue that was created by the division of labor was a lack of quality focus. Since my dad knew that I would be following him to do the detail trim work, he wasn’t too concerned about completing each plank. He was concerned about applying paint to the fence planks as fast as possible. While I was doing the large brush work, I had the same motivation. Getting the largest amount of square footage covered with paint meant the job was closer to being done. However, the job’s duration wasn’t strictly a function of square footage. It was a function of the duration to complete the trim work plus the duration to complete the large brush work. Ultimately we completed painting the fence. I would like to say that we had enough daylight left on Sunday to enjoy an ice cold lemonade on the deck and enjoy our work. I can’t. The sun was setting and we rushed to get everything done. Next time I will start with a quality focus and limit the work in progress be removing the division of labor. We will have a two person team working each side of a section of fence. Both the trim and large brush work will be completed before moving to the next section. This simple change will allow us to estimate the remaining duration, reduce rework and improve quality. Another suggestion - get a sprayer to do the fence. It will hit the trim and the big boards simultaneously, thus removing the constraint you describe.